Illustrated descriptions of over 250 genera of diatoms are presented for the first time in this wide-ranging volume. The introduction describes the diatom cell in detail, the structure of the wall (often extremely beautiful designs), the cell contents and aspects of life cycle and cell division. 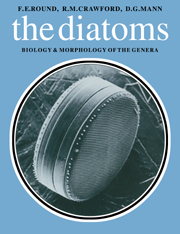 The generic atlas section is the first account of diatom systematics since 1928, and each generic description is accompanied by scanning electron micrographs to show the characteristic structure. Preface; Part I. Biology of Diatoms: 1. Preamble; 2. The diatom cell; 3. Collecting and studying diatoms; 4. Culturing; 5. Silicon: occurrence, uptake and deposition; 6. Cell symmetry; 7. Life form; 8. Valve structure; 9. Complementarity and heterovalvy; 10. Portules; 11. Ocelli, pseudocelli and pseudonoduli; 12. Raphe; 13. Girdle bands (copulae); 14. Internal valves; 15. Resting stages and resting spores; 16. The organic casing; 17. The protoplast: plastids, mitchondria, dictyosomes, nucleus, vacuole; 18. The cell cycle; 19. Vegetative multiplication and cell size reduction; 20. Sexual reproduction; 21. Oogamy; 22. Physiological anisogamy and isogamy; 23. Automixis and parthenogenesis; 24. Auxospore development; 25. Motility; 26. Ecology; 27. Palaeoecology; 28. Concepts in diatom systematics; 29. Evolution and phylogeny; 30. Fossils; 31. Accounts of genera - preliminary notes; 32. Summary of classification; Part II. Generic Atlas: 33. Centric genera; 34. Araphid genera; 35. Raphid genera; Appendix I: new taxa; Appendix II: list of recently described genera; Appendix III: index nominum genericorum; References; Taxonomic index; Subject index.